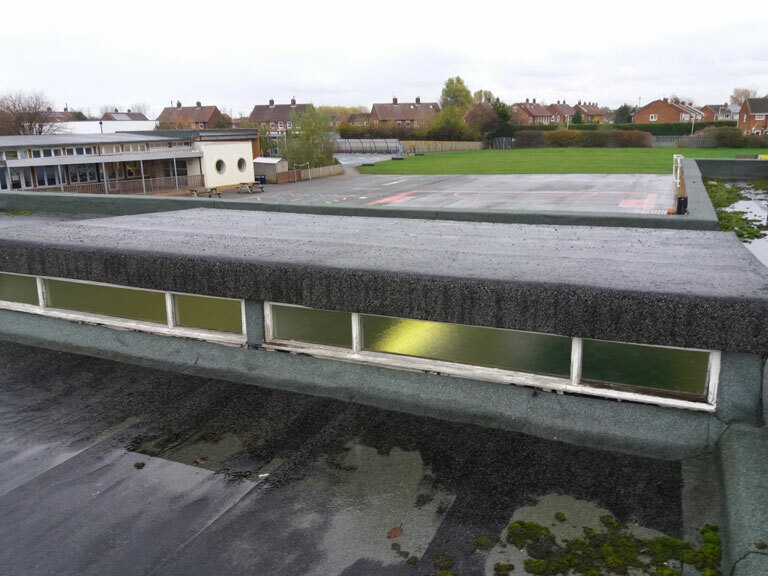 Continuing our posts about the repairs and replacement of flat roofs on a Primary Academy in Darlington, this week we look at the importance of flat roof on site inspections, how it helps everyone in the process and tell a story about one incident that demonstrated this in spades. The client in a schools project, in this case the Multi Academy Trust itself, but also the School Business Manager and the Head, can gain confidence and peace of mind from having their flat roof installation regularly inspected by a specialist during the works. These inspections satisfy the client that the roof has been installed correctly at every stage. 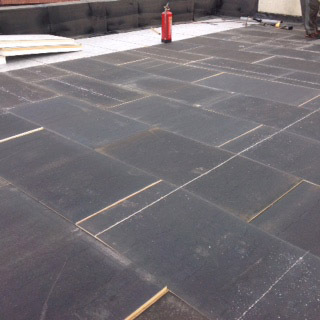 Key to the success of a flat roof installation or repair is the Warranty, which needs to be genuine – backed up by a credible and solvent provider and based on good practice. Flat Roof on site inspections confirm that the warranty will be met, and give the school confidence that they should not have to call in the Warranty and the roof will perform correctly throughout its lifetime, if the maintenance programme (which usually consists of 6-monthly inspections) is followed. On site inspections limit the client’s risk because they won’t have to claim on the warranty, but it also reduces the risk to the supplier and installer of the roofing materials. If the roof is installed and maintained correctly you shouldn’t have any issues with the flat roof for the lifetime of the roof, and everyone can rest easy that there won’t be any additional costs. On site inspections also assist the roofing contractor, because the specialist from SIG Design and Technology can provide expert help and support. Many of our contractors have been working on flat roofs for over 30 years so collaborating comes second nature to them. If we come across any design issues as the project progresses, we can discuss these with the contractor on site. Finding an issue early enough prevents it becoming a problem, whereas if you discover it later it can be very costly. By their nature flat roofs are sealed in, and it is only when you uncover the build up that some issues may come to light. An experienced team can identify the correct way to deal with such issues and prevent any mistakes or poor decisions arising from inexperience. During on site inspections we can discuss the best way to achieve the details planned in the specification, to ensure we achieve the most robust detail possible. SIG Design and Technology act as a constant point of contact, which enables the contractor to resolve any issues they have quickly and avoid delays in the programme. What does an On Site Inspection involve? We normally inspect a roofing project a minimum of once a week during the works, and complete an inspection document known as a SIGnature Warranty Inspection Report. 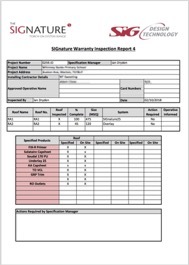 This Inspection Report is sent to the client, giving a snapshot of what is happening. In this way the client is fully informed about the stage of the work and always knows about any issues that have been identified and how they are being resolved. 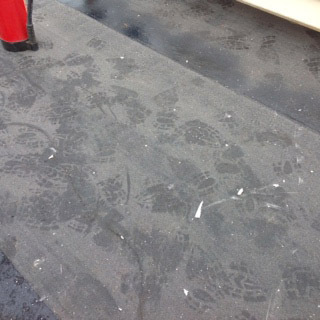 It was noted to the contractor that they needed to clean the roof correctly, before installing primer. Image shows correctly installed stagger bonded insulation; note the fire extinguisher on hand in case of fire and inline with HSE requirements. It is particularly important that we check that the VCL (Vapour Control Layer) is installed correctly, because incorrect installation of a VCL can cause condensation issues. 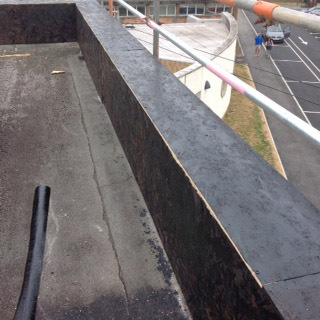 In many flat roof constructions, the VCL is adhered to the deck and then the layers above are glued to the VCL. These adhered layers are important to the construction as they prevent wind uplift from damaging the roof, particularly at the edges. 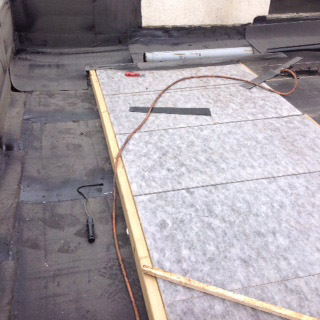 We usually use a PU (Polyurethane) adhesive to adhere the insulation to the VCL. The role of the VCL is to stop moist air traveling into the insulation, therefore the VCL itself needs to be fully sealed and terminated to the underlay correctly. During the inspections, we also will check that the insulation is the correct product (as per the specification), is adhered correctly, and that the adhesive is correctly applied. If the insulation forms a tapered scheme (where the insulation is cut to create the falls in the roof,) we will also ensure the tapers are installed correctly to avoid issues with standing water, for example. The next layer is likely to be an underlay – we check this is also fully adhered, and that the laps are sealed. In gutters, we check that the end- and head- laps of the membrane have been increased to 150mm to make sure of a more robust gutter detail. And of course we inspect all the other layers and check all the details around the works. On occasion the works will uncover aspects of the existing roof which were not possible to see during the survey, and in this case being present for regular inspections is particularly useful. Here’s an example from our primary school in Darlington. A set of clerestory windows over the existing toilet block had been inspected during the survey. Because the re-roofing could not fit in the required 150mm upstand from the new roof under them (with its increased insulation to meet current Building Regulations and improve heat retention), the intention was to close off these windows. The design stage intention was to install a set of new SIGnature Flat Rooflights in the existing deck to provide natural light to the rear of the toilets, which are also lit to the front with conventional windows. 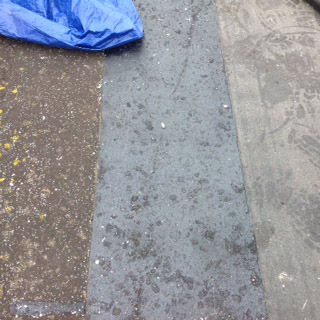 However, when the contractor stripped the roof off, we found that the reinforcement in the concrete deck would not allow their installation safely. This issue was picked up during an on site inspection shortly afterwards. We discussed the matter with the contractor, client and our surveyors and identified the best way forward, would be to install LED lighting at the rear of the toilet blocks to supplement the natural light coming from the other side. This would allow a robust detail at this point in the roof, keeping proper upstands, and it was a solution that could be implemented within budget. The late design decision also had other benefits. Whilst there is plenty of natural light in the toilet block on bright days, the LEDs would perform better than rooflights because they could enhance the lighting levels during dark mornings and evenings, as well as being cost effective. The outcome was therefore at no additional cost to the client, and provided a better solution overall. If you’re carrying out works to the flat roofs on your school, make sure your roofing professionals are working as a team. Ensure that weekly inspections of the work will be carried out to make the most of their professional experience, encourage communication and avoid delays and additional costs. 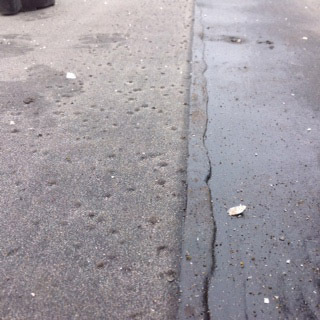 Find out more about our free initial survey of your school flat roofs. If you’d like to ask us a question you can comment on this post, or click the button below. Ian is an experienced specification manager with ten years working in flat roofing. He works with our technical team of surveyors, technicians and roofing specialists at SIG Design and Technology to deliver better flat roofs on schools across the country.